The sun is out, the heat is on, and there’s no better time than the summer for dance. With New York City’s numerous outdoor performance venues, it seems as if there’s always a show to catch. Here, Dance Informa highlights some of summer 2012’s dance happenings and directs you to where you can see tons of dance (often for free!). SummerStage brings over 100 performances of music, spoken word, theater and dance to NYC parks. This year, 23 dance companies will perform at SummerStage venues throughout the five boroughs – all for free. Preceding many of these shows will be a free, hour-long, all-ages dance class led by one of the many participating performing companies. This summer’s highlights include the world premiere of a special collaboration with the Limón Dance Company and Cuban composer Paquito D’Rivera to celebrate the company’s 65th anniversary, and also a commissioned work by Camille A. Brown and Dancers with live music by Imani Uzuri. Other companies on SummerStage Dance’s performance roster include Decadancetheatre, The Legendary House of Ninja, Jamal Jackson Dance Company, VON USSAR danceworks, MoralesDance, Koresh Dance Company, BalletX, WHITE WAVE Young Soon Kim Dance Company, DoubleTake Dance, Niles Ford/Urban Dance Collective and more. This year marks the 42nd annual Lincoln Center Out of Doors, a free outdoor summer festival. On August 3, at Lincoln Center’s Damrosch Park Bandshell, the festival will present Accordion Wrestling, a multi-media dance theater piece created by accordion composer Kimmo Pohjonen and Helsinki Nelson, a group of Finnish Olympic-style wrestlers, with choreography by Ari Numminen. Other performances include New York’s Heidi Latsky Dance, Cleo Parker Robinson Dance Ensemble and Heritage Sunday, an event that will showcase Haitian performing arts. All of the Lincoln Center Out of Doors events will take place on the Lincoln Center campus and are free to the public. This year’s Lincoln Center Festival will feature a run of 12 performances by the Paris Opera Ballet, which returns to NYC after 16 years. The company will present the U.S. premiere of Pina Bausch’s dance opera, Orpheus and Eurydice; a program of three one-act ballets by French choreographers and composers: Suite en blanc, L’Arlésienne and Boléro; and its current production of Giselle, choreographed by Jean Coralli and Jules Perrot. All performances will take place at Lincoln Center’s David Koch Theater from July 11-22, and tickets start at $25. The Lincoln Center Festival will continue with performances by Beijing’s TAO Dance Theater, a company founded in 2008 by modern dance choreographer Tao Ye and dancer Wang Hao, a specialist in Mongolian folk dance. The company will present two works: 2, a duet developed from the rhythms of the performers’ own conversations; and 4, a dynamic piece for four women. Tickets for the two performances, on July 25 and July 27 at Alice Tully Hall, start at $30. River to River Festival offers a variety of showings in music, dance, theater, visual art and film in areas of Lower Manhattan. This year’s dance events will take place at Mannahatta Park, Piers 15-17 at The Seaport, South Ferry, the World Financial Center Plaza, on Governor’s Island and more. Some highlights on this year’s River to River agenda include: Montréal-based choreographer Sylvain Émard’s Le Grand Continental, with a cast of 200 New Yorkers of all ages and backgrounds; open rehearsals and discussions with The Trisha Brown Dance Company; a work-in-progress by Tere O’Connor Dance; and a 300-person tap chorus presenting Tap It Out. All of the festival’s events are free of charge. 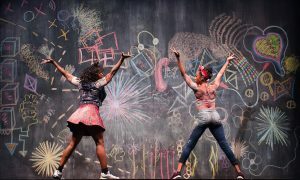 The Downtown Dance Festival (DDF) was started in 1982 by Battery Dance Company and has since been one of Lower Manhattan’s summer outlets for showcasing dance companies from around the world and also within NYC. The festival is free to the public and will take place throughout the week of August 11-18 at locations in Battery Park, One New York Plaza and indoors at Dance New Amsterdam. DDF is known for featuring dance companies within an expansive range – from classical ballet to post-modern, Indian classical to Afro-Cuban. DDF will also offer workshops led by leading American and international choreographers participating in the festival. The workshops will be open to the public to allow both professionals and beginners an opportunity to learn from these dance makers.